A new live estimation feature has been integrated for window and door positions. The price is generated automatically in the background and displayed in the top left corner. If you make any changes to the position, these will be immediately reflected here. 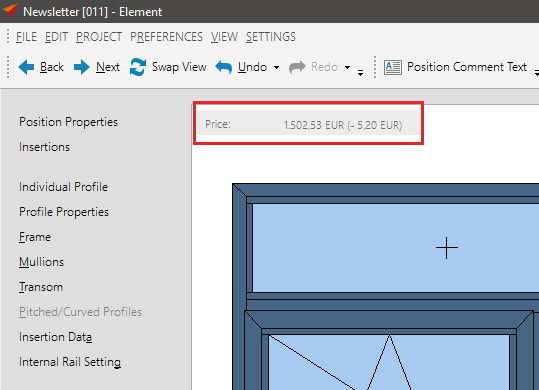 In the Estimation Data window you will find a new area on the top right labelled ‘Estimation during input of elements’. Live estimation settings can be made project-dependent or globally. For a project-dependent estimation, click on ‘Job’ > ‘Project Estimation Data’. Global estimation changes can be made under ‘User Database’ > ‘Estimation’ > ‘Data’. The ‘Estimation per position’ feature has been removed from the project header since standard estimation and position estimation are performed in parallel. If an estimation has already been generated for a project, the determined cut surcharge for the standard estimation will also be applied to the dynamic estimation during Input of Element. 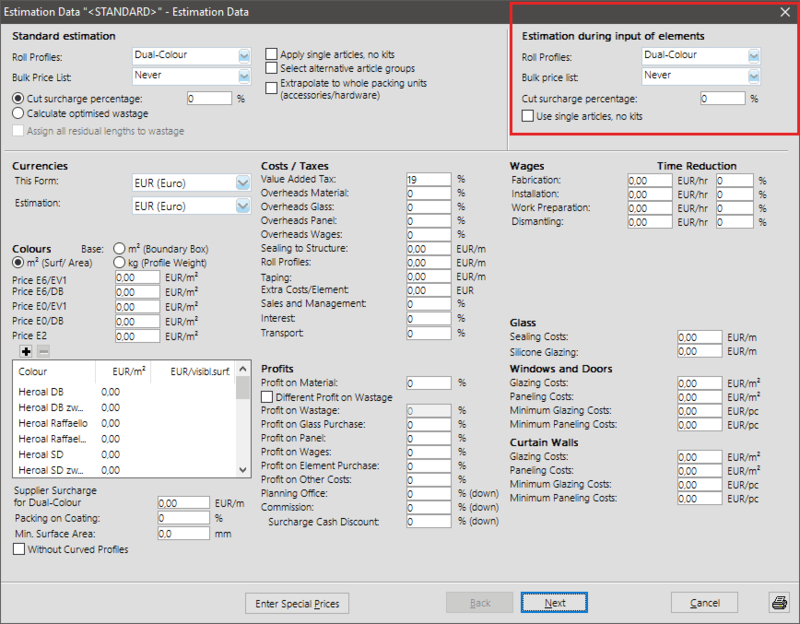 If an estimation has not been calculated and no cut surcharge percentage has been entered for the standard estimation, a value of 0% will be used for the dynamic estimation during the input of element. In order to use this feature, users must be given the ‘Estimation’ permission in the user administration area.